Offenders in community correction programs in Foshan, South China's Guangdong Province, are likely to have their movement and behavior monitored and shared on a blockchain-based platform, if authorities developing an electronic system have their way. "We are developing a system of monitoring offenders based on data collected from an electronic bracelet they would wear," Xie Linhua, an employee with Chancheng district judicial bureau in Foshan, told the Global Times. Xie said the technology company that undertook research on the platform will ensure that no data is leaked. Authorities will also pitch in to prevent data spillout. The platform was introduced to prevent offenders from fleeing and ensure compliance with rules, according to the website of the Chancheng judicial bureau. The digital bracelet can locate the person and monitor regular movements, setting off an alarm if he leaves the designated area. Police and employees will be alerted to the alarm. With the new system, the supervision department will not need to receive regular reports on offenders, investigate or monitor their movements with surveillance equipment, the Guangzhou Daily reported. "Offenders' daily movements will be kept secret and data cannot be altered. 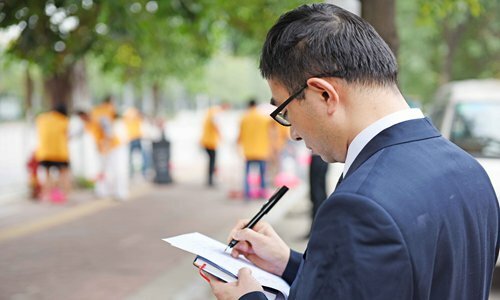 The supervision department could learn about offenders' behavior from the platform, such as jaywalking or a good deed," Liang Zixi, director of the Chancheng district judicial bureau was quoted as saying by the Guangzhou Daily. Accessing the movement of inmates of correctional facilities could also prevent duty-related crimes by civil servants working for community correction programs, the judicial bureau said on its website. The real-time movement and their personal information stored on the platform will be shared with police, judicial department, court and procuratorate department to improve working efficiency. In the near future, Chancheng judicial bureau will establish credit assessment system of offenders that will be based on their movements and behavior which is stored on the platform, the preliminary development of which is expected to be complete by the end of this year, Xie said. Credit assessment will accompany offenders for the rest of their life and it will be hard for them to purchase property, get jobs, apply for loans and go abroad with a low score, according to Chancheng judicial bureau. "The platform and credit assessment system will be promoted in the district and Foshan city, if it proves to be good," Xie said. Ruan Qilin,a professor at the China University of Political Science and Law, told the Global Times that people subjected to community correction in China are those given a reprieve, released on parole or sentenced for less serious offences. "It's important to ensure that the data and movements of offenders are only used for community correction program, and only accessible to relevant departments, in a bid to prevent leak of information," Ruan said. Qin An, head of the Beijing-based Institute of China Cyberspace Strategy, said that the new blockchain-based platform used for community correction should be encouraged, but authorities should come up with regulations on what kind of information on offenders could be collected. Can offenders cheat by asking others to wear the bracelet while they move about freely? No. Xie said authorities will make sure that only supervision department employees can lock or unlock the bracelet. According to the Guangzhou Daily, the Standing Committee of the 12th National People's Congress (NPC) planned to draft a community correction law this year. The use of blockchain could do away with a communication gap among government departments, and the community correction law should have a fair share of government information, Kong Fanhua, a law professor at South China Normal University told the Guangzhou Daily. Kong said government information sharing refers to information collection, verification and supply, which should be standardized in the community correction law.